Jeremy Hackworth submitted this photo and caption. After 11 years since their age-out season with the Madison Scouts in 1999, Jeremy Hackworth and Hugo Ramirez reconnect at the Southern California Percussion Alliance Championships in San Bernardino, Calif. Jeremy currently serves as the director of bands at Etiwanda High School in Rancho Cucamonga, Calif., and is also entering his third season as the low brass technician with the Boston Crusaders. 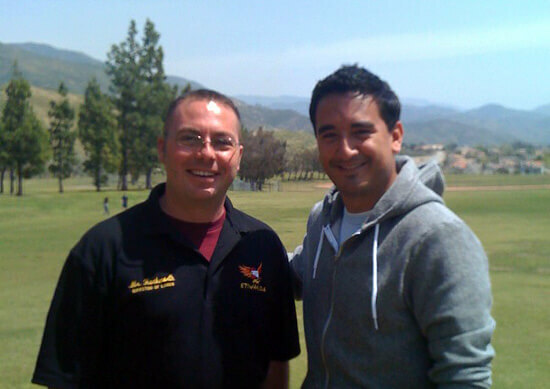 Hugo teaches percussion with numerous groups in Southern California such as Helix HS, Rancho Bernardo HS, Poway HS and most recently Mira Mesa HS. He also has been the tenor drum technician and battery caption for San Diego Alternative Percussion Ensemble while also arranging for the group.